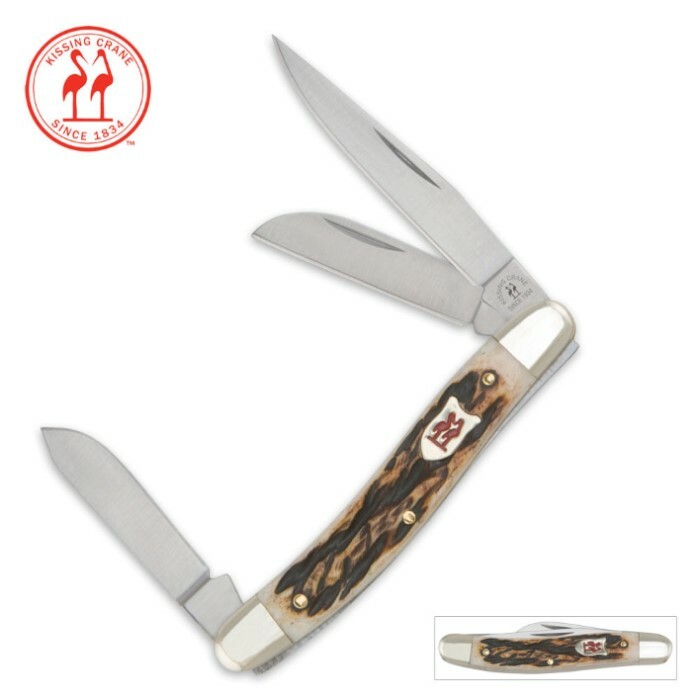 Kissing Crane Burnt Bone Stockman Pocket Knife | BUDK.com - Knives & Swords At The Lowest Prices! You won't find a better folding pocket knife at a better value than this classic Burnt Bone Stockman pocket knife from Kissing Crane. From the quality blade to the handsome burnt bone handle, this pocket knife is sure to please. I agree completely with Dan from WV. The Kissing Crane Knives are much better quality than the one Case knife I bought recently! The burnt bone stockman and trapper are both unbeatable for the price! They make a very nice addition to any collector's set. In the past 6 months or so, I have bought 6 Kissing Crane Knives from BUDK and also some Case Knives from other sources. The workmanship of the Kissing Crane is far better than the Case or Hen & Rooster, even they are made in China. I think it is time for the American Workers to wise up. I would like to see more Kissing Cranes on your website like you have before.